It operates every day of the year. The low season schedule (November to February) is from 10:00 to 18:00.The high season schedule runs from March to October from 9:00 to 22:00. The starting time is the time of departure from the departure points for each route, and the end time is the time when the buses return to the terminals. The ticket is valid for all the routes for 1 or 2 days, depending on which option you have chosen. 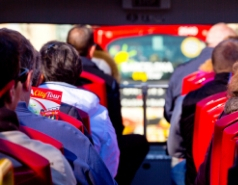 You can use the Madrid tourist bus with both one-day tickets and two-consecutive-days tickets, provided that there are free seats and you show that you have a valid ticket for that day. The frequency of the bus routes is 8-9 minutes in high season and 14-15 minutes in low season. This frequency is only approximate, and may vary depending on traffic conditions. Passengers should remain seated throughout the excursion for their own safety. Lifting or waving any objects above head height. Throwing any type of objects or packages. Adopting any position apart from the normal sitting position on the seats. On the days when the tours are cancelled, due to traffic interruptions, passengers will be informed through notices at the bus stops. Passengers will not be entitled to a refund of the purchase price in the event of bad weather, or changes to the bus services due to any event/cause that is beyond the control of UTE Madrid City Tour. You should keep your ticket on you during the route, as a company employee may ask to see it at any time. If you lose it you will not be able to board the bus, or continue with the route. Pre-purchase your Madrid iVenture Card through our official agents or online and you can pick up from our Collection Points in Madrid. Details of all collection points will be printed on your receipt. Please remember you will be required to bring with you your receipt of purchase and present it to the staff at the Collection Point. Please allow 24 hours for your package to be available for pick up. Your pre-purchased Madrid iVenture Card can be collected at the following places in Madrid. What is an City Pass/iVenture Card package? Each City Pass/ iVenture Card package includes a range of attractions, experiences and popular things to do all on a single smartcard. Each iVenture Card is loaded with one iVenture package which includes entry to a selection of individual experiences such as cruises, tours or attractions. Your choice of experiences varies depending on which package you choose. Each package provides you with complete flexibility to create your own itinerary and convenience to see the things you want to see when you want. Each Package comes packed with a guide to all participating attractions so all you need to do is show your card and have all the fun! What are the benefits of an City Pass/ iVenture Card package? With your iVenture Card package you will receive amazing savings and value whether travelling alone or with your family and friends. Every package offers free admission to large range of attractions and experiences and the convenience of having it combined on one prepaid smartcard. Does the City Pass/ iVenture Card package come with a guide? Yes. Every iVenture card package comes with an easy-reference, colour guide with a map which provides details on participating operators including address, contact details and special offers. Operator details do change from time to time, so it is recommended that you view our online list of attractions and operator websites for the most up-to-date information. Is there an City Pass/ iVenture Card Package for children? Yes, there is a large range of exciting attractions, which kids will love. Our range of attractions packages is available for children aged between 4 and 13. Children who are 14 or older will need an Adult package. Children under 4 are subject to fees payable to individual attractions. Do you have a family City Pass/ iVenture Card package? No. There are currently no family packages available and each member of your party will require their own package. However the savings are substantial for family groups too. How long is the City Pass/ iVenture package valid for? Since the activation, you have 7 days until the card expires. Do I have to use my City Pass/ iVenture Card in consecutive days? Yes, you have 7 consecutive days. What time does the Madrid City Pass package run out? 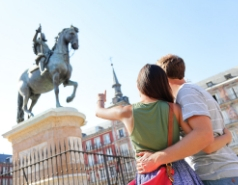 Your Madrid City Pass package is valid for calendar days, not for 24-hour periods. It will run out on the final day of the 7 days duration. If you don’t use the package, unused benefits will expire 12 months from date of card issuance. Does the City Pass/ iVenture card need to be signed? Yes. All cardholders need to sign the card – both adults and children. For security purposes we recommend that you sign the card as soon as you receive it. Please note that once signed, no refunds or exchanged can be made. If you make a purchase and do not receive any email with the vouchers attached, please, contact us in customers-mad@city-tour.com and we will send them to you. No. Your iVenture Card is all you need to gain access to the attraction or venue. You will be asked to sign the back of your card before you start to use it. Once you reach your chosen attractions or venues, simply present your card at the admissions point. No. The iVenture Card is designed to show you around the city and see as much as you can, different attractions and experiences. No. However due to limited availability on selected tours and experiences, we do recommend that you call ahead to reserve your place and we have noted this on these attraction in your easy-reference guide that accompanies your iVenture card package and also on each attraction listing online. Some of the attractions and experiences do need to be booked in advance. Phone numbers and booking procedures can be found in your iVenture Card package guide. Moreover, you can contact us through info@iventurecard.es. It depends on the season. The operational frequency ranges from 8 minutes in high season (March to October) and 15 minutes in low season (November to February). However, these frequencies may vary, because of traffic, number of people at stops, and others. The frequency of the buses means that you can do the whole route throughout the day up until 80 minutes or 65 minutes before the bus services finish for the day. The 16.40 and 20.40 buses (depending on the season) are the last ones which will allow you to do the whole of route 1. The 16.50 and 20.50 buses (depending on the season) are the last ones for route 2. MADRID CITY TOUR service has been designed in the way that Route 1 lasts about 80 minutes and Route 2 lasts about 60 minutes. However these routes times may vary, because of the traffic, the number of people at the stops and others. Remember that you can hop on and off at any bus stop when you like on the same day. Is it possible to get into the bus at any stop, or should I go to the first stop in the route? If you already have your tickets or would like to purchase them on the bus itself, you may get the bus at everyone of the MADRID CITY TOUR stops. Yes, the ticket allows to hop on-off and change the routes as many as you like, using it in a non-limited way, during the official schedule of MADRID CITY TOUR. With the exception of guide dogs, no animals or pets of any kind are permitted on board Madrid City Tour buses. Do I have to buy a ticket for each route? No, the ticket allows to hop on-off and change the routes as many as you like, using it in a non-limited way, during the official schedule of MADRID CITY TOUR. The MADRID CITY TOUR ticket is valid for one or two consecutive days, as you choose and its validity fits with MADRID CITY TOUR schedule. 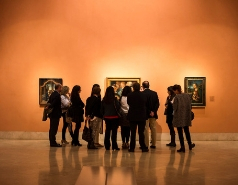 MADRID CITY TOUR tickets may be bought by fours different ways: going to our main sale point (calle Felipe IV, between the Prado Museum and the Ritz Hotel); on the bus itself, which may be got into at any point within the route; in this web site; or through the app City Tour Worldwide. I have already purchased my tickets, but I can't print the voucher, what can I do? You can show your ticket through your electronic device. If this is not possible, please note down the booking reference number (several numbers and letters) that bears on your screen. Go to our Information Center, located at Felipe IV str., between Prado Museum and Ritz Hotel, and explain to our staff what happened to you. Just identify by showing an ID or a passport. Once checked your booking you will be given your tickets. When paying with my credit card, the system denies the operation, what can I do? Our online system only accepts AMERICAN EXPRESS, VISA and MASTERCARD credit cards. If you are trying to pay with other card, the system will deny the operation.